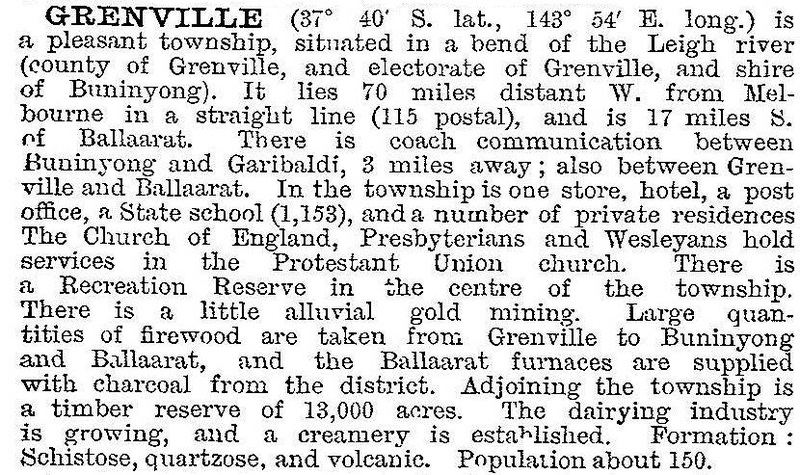 Grenville shire (1863-1994) adjoined the south-west of Ballarat and extended nearly to Skipton and Lismore. Its area was 845 sq km, and its main centres of population were former gold mining towns along the Glenelg Highway. It was named after William Grenville, First Baron (1759-1834), English parliamentarian and mover of the resolution for the abolition of slavery in 1806-07. When the shire was proclaimed on 16 February 1863, it lacked the townships of Scarsdale and Smythesdale, which were separate gold mining boroughs until 1915. Its administrative centre was Linton (also a gold mining town). Near to Linton there was the mining village of Happy Valley, and there were settlements at Cape Clear, Haddon, Piggoreet and Pitfield, all of which had mining activity during later periods. Most of these settlements are in the vicinity of Woady Yaloak Creek and its tributary, Smythes Creek. The shire’s northern area comprised hilly ranges, giving way to plains in the south. In 1883 a railway line was extended from Ballarat to Scarsdale, and in 1890 it was extended from Scarsdale to Linton. A branch line from near Scarsdale ran south to Cressy (1911-53). The Linton line was closed in 1983. During the late 1960s the north-east sector of the shire, adjoining Ballarat, was developed industrially, with residential subdivisions. The area had been a munitions factory during the war. The suburb was named Delacombe. Further out from Ballarat, population increases occurred with rural/residential subdivisions during the 1970s and 1980s. In 1994 farming occupied 55% of the shire’s area, on which 253,000 sheep and lambs were grazed. Meat and dairy cattle were fewer than 5000 head. 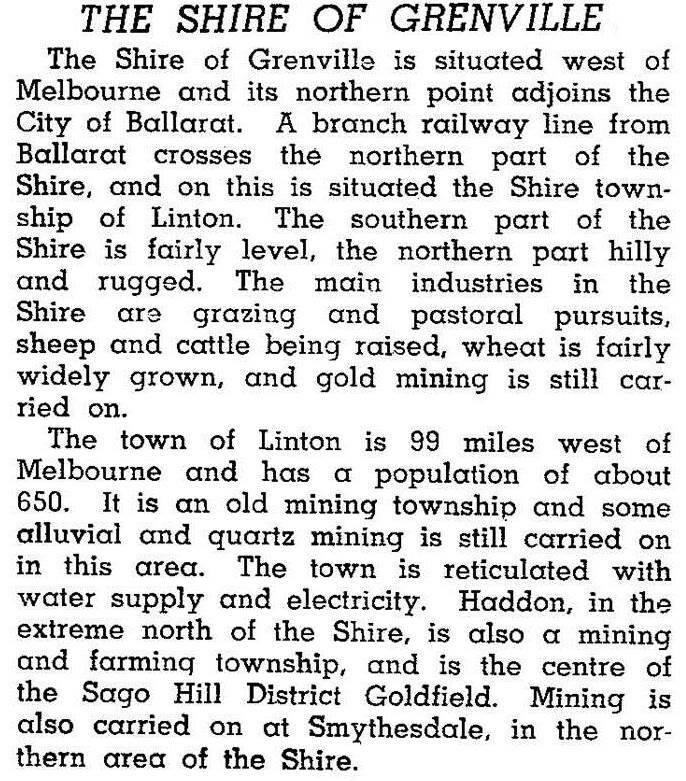 Grenville shire ceased on 6 May 1994. Its north-eastern urban sector was absorbed by Ballarat city and the rural area was united with Bannockburn, Leigh and part of Buninyong shires to form Golden Plains shire.